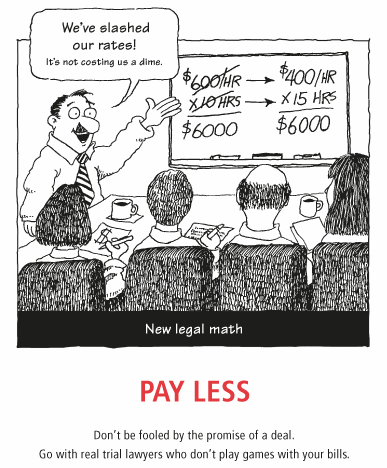 Ross's Law Marketing Blog: "Lawyers lie, cheat and overbill! Haha. Sorta kidding!" "Lawyers lie, cheat and overbill! Haha. Sorta kidding!" 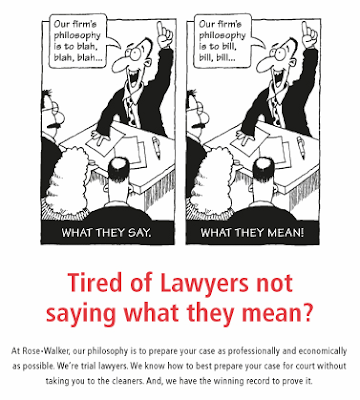 I think most lawyers have a pretty good sense of humor. But I've never been a fan of marketing or advertising campaigns that directly demean your competitors. Even if it's couched as a "joke." Pepsi's marketers thought they compared favorably to Coke and so encouraged consumer to "Take The Pepsi Challenge." They didn't advertise "Coke tastes like crap!" Rose Walker is a 16-lawyer Dallas litigation boutique firm that prides itself on its value, efficiency, and trial skills -- all of which are strong, client-oriented attributes. I hear it's a terrific firm. 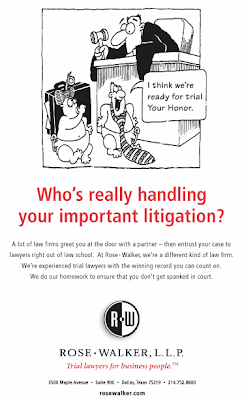 For a number of years, the firm has been running a cartoon advertising campaign that seeks to differentiate itself from its competitors -- arguably from the entire legal profession. I'm not a big fan of this type of campaign. I feel that disparaging an entire category, e.g. 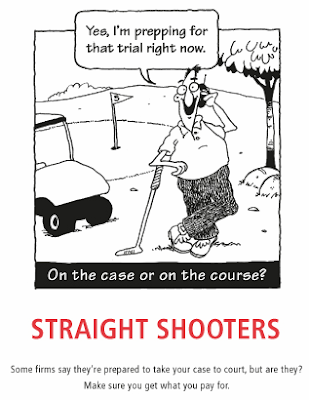 "colas" or "lawyers" taints everyone in it, including the advertising company itself. The cute illustrations soften some of the edges of the message, but just a little. It's still pretty harsh. At Fishman Marketing, we've developed marketing campaigns for 15 years that built up our firms and clients without directly questioning their competitors' skills or integrity. You can have a little fun with your competitors if you do it with a "wink," but it's a very thin line between sly humor and offensive insults. Employing this strategy is playing with fire. 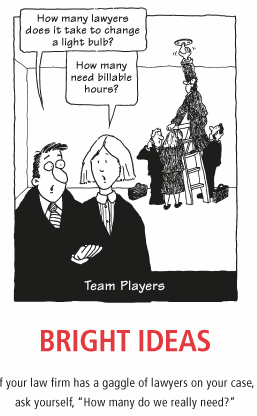 Firms can highlight their positive experience, attributes, or distinctions. They can identify credible differentiators in terms of size, specialty, style, or service. There are countless options and variables to choose from. That is, if you choose to highlight your own integrity, you can do so without directly declaring your competitors to be "cheats." 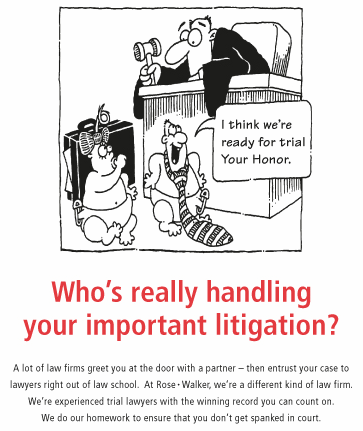 (2) Insulting the hand that feeds you (if like most litigation boutiques, they seek referrals from other firms). This is a relatively common direction for newer firms that feel like they have to try a bit harder to get noticed. 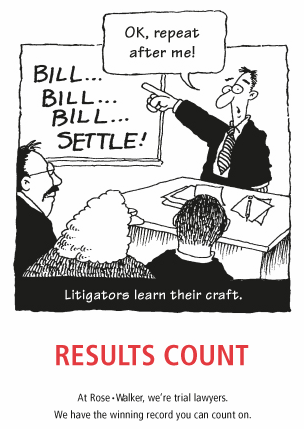 Now that the firm is over a decade old, we'd suggest pursuing a new, more-confident, more-positive direction. I think it's time to put this campaign to rest. If you'd like to see some examples of a positive campaign that would highlight your experience, we would be happy to create one for you -- at half off our usual fees. All images (c) Rose Walker LLP.